I've seen a lot of "talk" on blogs lately about Julia Child. I suppose it is because there is a new movie out about her life. She was an amazing chef and I still enjoy watching her TV shows on PBS. For years, I've heard about pate a choux dough and have definitely eaten my share of eclairs and profiteroles in my life. I've also heard how easy they are to make. "Sure", I thought. "This is the kind of stuff that Julia Child makes, not me!!" And so, I put it off. Until Friday. Friday afternoon, I had nothing going on. Nothing planned. All my housekeeping duties were completed for the day. 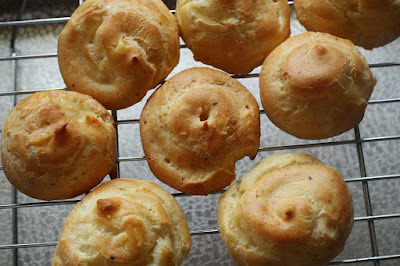 It was a quiet, rainy afternoon and nothing stood between me and gougeres except fear!!!!! And fear I did, until I started cooking. Once I started, I discovered that this "fancy" recipe wasn't quite so hard at all! In fact, it is, by far, the EASIEST bread type of recipe I have ever made!!! So, if any of y'all have ever wondered about the pate a choux process, press on!!! I used Amy Finley's recipe from Gourmet Next Door. I used half the dough and made gougeres (with Swiss instead of Gruyere) and the other half for, what will be, profiteroles. 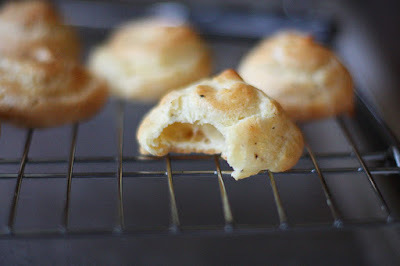 I froze the profiteroles and will make them into the real deal this week (complete with yummy cream filling) for dessert. What recipe have you feared making and then, once you started cooking, you didn't fear it so much after all?? I fear makeing a souffle, but I have yet to conquer my fear. I have also never made a stock from scratch, not out of fear but out of laziness. I also fear making a creme brulee, which I have never tried. Maybe it is time for me to get some courage and get to cooking! Stock, yes, it does take a while but SOOO worth it!!! You'll be SO happy when you do it!!! But if he likes eggs with cheese... he will LOVE it! It really isn't that hard at all, the hard part will be not eating every last bit of it!! Pate a choux - cream puffs in our neck of the woods! I remember making them as a girl! Just don't forget to poke them when they come out of the oven so they don't collapse! Julia is certainly one of a kind. I haven't found any cooking show that is as wonderful as hers. I fear pie crust from scratch. I am terrified of how it will turn out. I hate to admit this, but I usually opt for Pillsbury! I was afraid of making a jelly roll until a few months ago when I tackled it, finally, and it was really easy . . . not to mention yummy! The pastry dessert Napoleon always seemed intimidating. It actually isn't hard, just time consuming. I've never made a souffle...I need to get a dish and tackle that fear! And ganache always looked and sounded scary but it turned out to be easier that buttercream. That movie Julie and Julia sounds really cute! I have the two Julia Child cookbooks used for the blog, I have the book the movie is based on , and I have a fantasy! I want to do this! I want to cook and blog! Napoleon!!! Thanks, Betsy!! I need to add that to my list!! Mrs. U ~ I see you're a bit of a foodie! :o) I always keep an ever-changing pile of recipes that are my shortlist for future baking. I just recently added my cream puff recipe to the pile. I don't think I've made them since high school (when I made them fairly often for French class parties aka "cultural experiences"). I'm going to check out the recipe links you provided. I now it may sound bizarre, but I love to compare recipes to each other. I think it's my attempt to always find the "perfect" recipe. I would love to see the new movie, but I'm thinking with a nursing baby waiting for the DVD will be a much better option. I did just read tonight on a blog that the book Julie - Julia by Julie Powell is not very good (lots of profanity and other undesirable things to read about!). Instead it was suggested to read My Life in France by Julia Childs. The movie is supposed to be based on both books. Just wanted to add: I've seen some more reviews on this book and movie. I'm not so sure I want to see the movie now! I'm hearing that the book is beyond awful and that the parts of the movie that focus on "Julie" are not good either. However, the parts that focus on "Julia" are supposed to be great. *sigh* I don't think I could stomach the bad for the sake of the good.